Abstract. Although there are many definitions of a high-need (or high-risk) school, typically researchers and policy makers agree it is a setting in which a vast percentage of students are (a) living in economic disadvantage, (b) from racially diverse backgrounds, (c) identified as having a disability, or (d) underperforming academically. Many teachers in high-need settings are new to the field or have experienced persistent challenges demonstrating effective classroom management. As a result, these teachers might benefit from intensive data-driven coaching to improve classroom management practice. Yet, existing empirically supported comprehensive coaching models tend to require resources that may be scarce in high-need settings. In this multiple-baseline single case research design study, teachers who requested assistance to provide effective classroom management received feasible coaching support (i.e., explicit didactic training, booster training with verbal modeling). Teachers implemented comprehensive classroom management plans with the highest level of treatment fidelity upon receiving booster training, and class-wide student behavior improved. Abstract. The current study was designed to evaluate the effects of a tootling intervention, in which students report on peers’ appropriate behavior, modified to incorporate ClassDojo technology, on class-wide disruptive behavior and academically engaged behavior. An A-B-A-B withdrawal design was used to evaluate the effects of the intervention in 3 fifth-grade classrooms. Student-produced tootles were recorded using the ClassDojo website and displayed to students via projector. Reinforcement for tootling was provided through an interdependent group contingency based on the number of tootles produced. Results indicated substantial and meaningful decreases in class-wide disruptive behaviors and increases in academically engaged behaviors during intervention phases compared to baseline and withdrawal phases across all three classrooms. Limitations, implications for practice, and directions for future research are discussed. Abstract. A growing body of research exists on the effectiveness of classroom-based intervention programs to prevent and ameliorate social, emotional, and learning difficulties demonstrated by young children at risk for emotional and behavioral disorders (EBD). Yet, little research has examined the influence of these targeted intervention programs on the teachers who are trained to deliver them. Impacts of the professional development associated with the intervention on teachers who implement the intervention are important to examine. Data from a 4-year study examining the efficacy of BEST in CLASS were used to examine the effect of BEST in CLASS on teachers’ implementation of effective instructional practices, their sense of self-efficacy, and classroom quality. Using a multisite cluster randomized trial, a total of 186 early childhood teachers were included (92 assigned to BEST in CLASS and 94 assigned to a comparison group). Findings indicate BEST in CLASS positively impacted teachers’ use of effective instructional practices, their sense of self-efficacy, and their overall classroom quality compared to teachers in the control condition. Future research and implications for professional development are discussed. Abstract. This study examined which factors were related to placement choices for inclusive regular education or exclusive special education for Dutch students with social, emotional, and behavioral difficulties (SEBD). Students aged 6–11 in three subgroups participated: 45 included and 17 excluded students with SEBD (i.e., educated in regular education classrooms and in a separate setting exclusively for students with SEBD, respectively) and 772 typically developing peers. Before placement choices had been made, we collected data from students and teachers during classroom surveys and individual testing sessions with students with SEBD and from application files. Using Bayesian statistics, we found that included and excluded students with SEBD were similar in student functioning prior to placement, whereas teachers of included students had lower self-efficacy and more positive attitudes toward inclusion than teachers of excluded students. Furthermore, included and excluded students perceived their social– emotional functioning more negatively than typically developing peers. Hence, although considered essential by existing policies, placement choices may not depend on student functioning, but teacher factors may play a role. Abstract. Students exhibiting challenging externalizing behaviors may benefit from supportive interactions with teachers. However, if students show high levels of externalizing behaviors, this may negatively impact on student– teacher interactions, and vice versa. We therefore examined bidirectional developmental links between student– teacher interactions and externalizing behavior of male adolescents placed in special education because of psychiatric disabilities. Participants were 584 adolescents (Mage = 15.0 years, SD = 1.7) and their teachers from 14 Dutch special education schools. At 3 time points, student-reports of student–teacher interactions and teacher- reports of adolescents’ externalizing behavior were collected. Using autoregressive cross-lagged models, results indicate that externalizing behavior predicted decreases in supportive interactions (β = −.09, p = .02), but not in negative interactions. Student–teacher interactions did not show a significant influence on externalizing behavior. Our results highlight externalizing behavior as an important target for interventions intended to improve student– teacher interactions. Abstract. A positive behavioral interventions and supports (PBIS) framework has been associated with a variety of positive student and school outcomes. However, additional research would be useful to further understand the relationship between school-wide (i.e., Tier 1) PBIS implementation level and student outcomes. 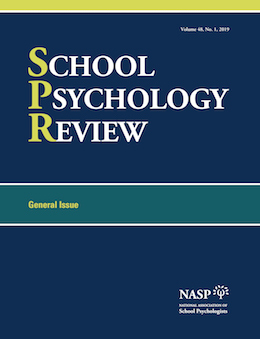 This study examined whether there were differences in discipline and academic outcomes based on Tier 1 PBIS implementation fidelity level in 153 Ohio schools when accounting for key covariates. Schools with higher implementation fidelity were found to evidence a significantly lower number of out-of-school suspensions per 100 students than schools with lower implementation fidelity when accounting for demographic covariates. However, a significant trend was not evidenced for the academic achievement outcome variable. Limitations and implications of this study are discussed. Abstract. The number of opportunities to respond (OTR) and spacing (massed or distributed practice) of practice sessions are important variables to consider in instructional design. The purpose of this pilot study was to compare the impact of these variables on trajectories of mathematics fluency. Second- and third-grade students (N = 112) were randomly assigned to 1 of 4 conditions: (a) distributed practice, low OTR; (b) massed practice, low OTR; (c) distributed practice, high OTR; and (d) massed practice, high OTR. Students completed 1 practice session using cover-copy-compare for subtraction according to the group assignment. Multilevel modeling of 4 assessment time points (pretest, follow- up at 1, 4, and 7 days) was used to evaluate differences in retention (correct digits) between groups. After controlling for prior math knowledge, instructional level and OTR, but not spacing, were significant predictors of final score. These findings suggest that OTR is an important variable to consider when planning for instruction and intervention. Abstract. Group contingencies are an effective way to prevent and address problem behavior; however, the extent to which these effects transfer to settings where the intervention is not implemented (i.e., setting generalization) is unknown. Using a multiple baseline design, this study assessed the setting generalization of the effects of an interdependent group contingency on decreasing off-task behavior in elementary students with emotional and behavioral disorders. A combination of generalization strategies was used, including maximizing the response’s contact with reinforcement, making the instructional setting similar to the generalization setting, training multiple exemplars, and training to generalize. Participants included three classrooms (N = 22 students; 3 female, 19 male) in grades K–6. Results showed that intervention effects did not automatically generalize across settings. With the addition of the generalization strategies, behavior in the generalization setting reached levels similar to the instructional setting, indicating the strategies were successful. Implications for practice and research are discussed.